After a long running battle between Basildon Council and travellers at Europe's largest illegal travellers' site, police and bailiffs finally moved in to begin the site clearance in the early dawn on Wednesday. 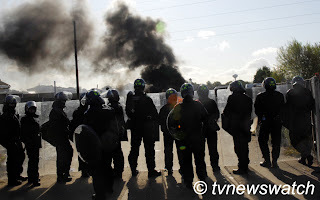 Acting on intelligence that protesters at the Dale Farm site had stock piled offensive weapons to be deployed against those enforcing the eviction, riot police entered the site ahead of bailiffs. They were met with a barrage of missiles including rocks, bricks and liquids. In the brief but at times violent battle, police shot at least two protesters with X26 taser weapons. In the early clashes several protesters were arrested. 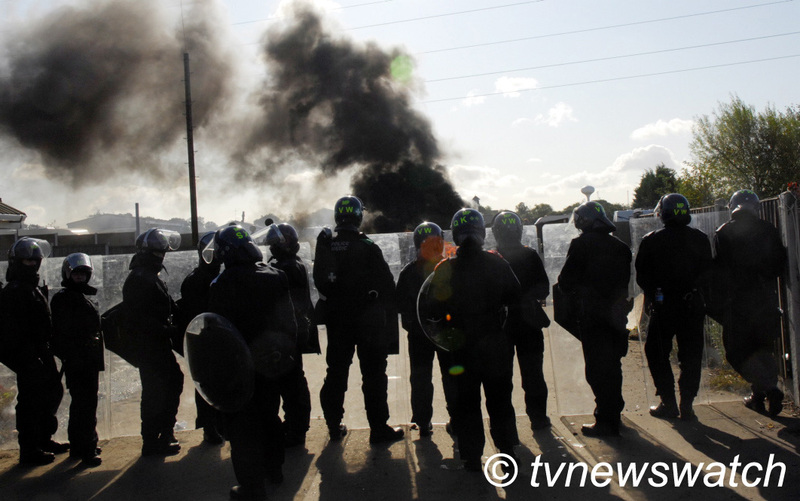 Protesters attempted to keep police at bay by setting fire to barricades and a caravan was also torched. By mid morning there was a relative calm and police surrounded the main scaffolding situated at the site entrance. As line of riot police kept back scores of press and the few remaining travellers on the site the slow procedure of removing the protesters on the scaffolding began. At first police attempted to talk to the protesters, but it was clear that they were not willing to leave peacefully. And so began the methodical removal of each of the supporters from the structure, some of whom had chained themselves to the scaffolding. By late afternoon twenty three people had been arrested and led away, according to Essex Police, with charges ranging from violent disorder to obstruction. But the operation was far from finished. As the sunset over Dale Farm and operations were wound up for the day police remained on site to guard the structure and prevent anyone from reclaiming the fortification. Travellers have accused the police and Basildon Council of overkill and say several people were injured in the operation. For their part Essex police, backed up by officers from Surrey, Wales and London, insist they acted within the law. Meanwhile the Essex Ambulance Service say they had treated six individuals but that their injuries were minor. The use of tasers during the operation has been defended by Essex Police who say they were deployed after they faced a serious level of violence.